Fantasy football is a pastime enjoyed by countless fans just like you. There’s no better way to enjoy your favorite sport than by gaining involvement with a carefully-crafted fantasy roster. And by using a fantasy football logo maker, you can actually brand your team and bring it to life. Fantasy football logo designs are just like any other marketing tool. They need to be flashy, colorful, and stylish. Plus, they shouldn’t take a ton of time to make. By using Placeit’s fantasy football logo generator, you can build out an incredible football logo design in just a few clicks. Your team will look truly professional, and you’ll have more time to devise a winning strategy on Sunday! Best of all—you can use these for real-world teams as well! Let’s explore how to quickly build a football logo with Placeit. Placeit is a powerful online creative resource packed full of stunning graphic designs. With Placeit, there’s no need to own complex and expensive editing software. Instead, Placeit lets you create your own football logo design all inside your favorite web browser. Placeit’s pre-built templates are designed by creative professionals, ensuring you start off with a perfect foundation. The Placeit football logo generator makes it easy to select a key image, text, and signature colors to create logos in minutes. Once you select the template of your choice, the dynamic fantasy football logo maker tools allow complete customization. You can adjust text, fonts, font sizes, colors, design elements, and more. No graphic design or editing experience is necessary—just fill in the blanks! This degree of easy customization is hard to find in advanced editing software, but with Placeit you’ll find it present in each and every template. Once you’ve filled in the online editor with your own content and chosen a style, simply download the finished product and start using it anywhere you want to display your fantasy football logo design. So, we’ve already talked about how to make a football team logo with Placeit. The ease and flexibility are virtually unmatched in the creative sphere, and hopefully it’s inspired you to make your own cool fantasy football logos. The first step is really to choose a football logo design that matches your team. Just like mascots and colors in the real world, fantasy football logo designs set a tone and feel for your virtual team. It’s important to choose wisely up front. What you’re building here is truly the public face of your fantasy team. You can always adjust every element later, but there’s no substitute for building the ideal football logo design right from the start. Placeit has dozens of diverse and fun football team logos available for use. As you search, you’ll see preview thumbnail images of each design. Remember, these previews only just scratch the surface. The fantasy football logo generator enables countless customizations and changes to each one. Let’s look at three of the best. The Sports Team Logo Maker is full of logo possibilities for your fantasy football team. What do a Viking warrior, a mustachioed cowboy, and an alluring mermaid have in common? They all have starring roles in the myriad design possibilities found in this human fantasy football logo maker. There’s perhaps no better way to promote your team than to give it a human face. You can do just that here, by selecting an unforgettable mascot and pairing it with your own colors and text. The animal kingdom lends itself well to intimidating logos like this one in Placeit’s Clever Animals Sports Logo Template collection. If the human element isn’t right for you, try moving on to the animal kingdom. In this template you’ll find a stunning array of wildlife logos and mascots suited to every style. Choose a majestic lion, an angry chipmunk, or anything you can imagine in between. This is one of the easiest ways to build out a truly unique and memorable brand for your fantasy football team, and the league logo creator makes the edits a breeze. The Sports Logo Maker – Peculiar Things is ideal when you want to create a fantasy football logo design that’s really different. Sometimes people and animals might seem too cliché, or perhaps they just don’t fit with the look you’re trying to achieve with your brand. The peculiar things template from Placeit is the ideal remedy for your football logo design. Browse through the options and use icons as varied as a bridge, a plane, a rocket, and a bell. Most people who see your new custom fantasy football logo design probably won’t ever have seen those objects as football mascots. This can mean only one thing: they’re sure to take notice and remember you! Now that we’ve previewed Placeit’s best fantasy football logo designs, let’s work on building out a brand-new custom logo for our fantasy team. For the purposes of this tutorial, let’s say our fantasy team is called the Seattle Sabres. We want to build out a logo to use on a variety of materials; for example, shirts, hats, posters, and more. Fortunately, with Placeit, what would ordinarily be a tiring and complicated challenge is reduced to just a handful of quick and easy clicks. 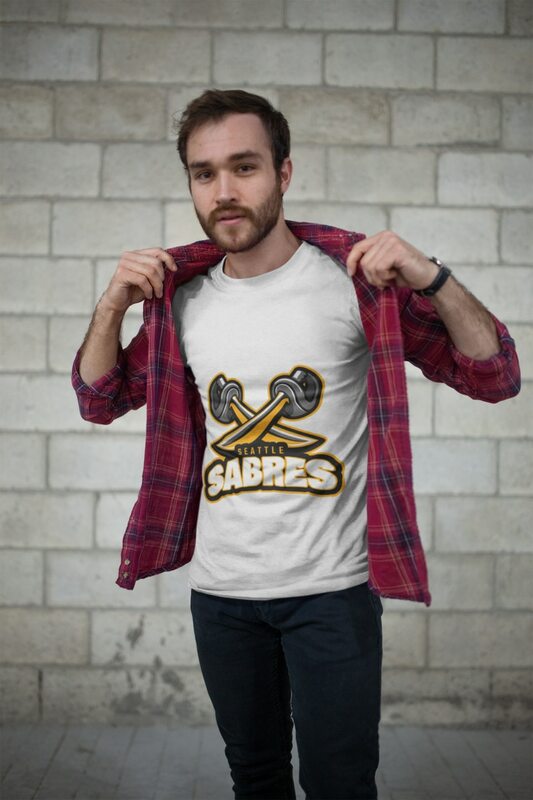 For our Sabres’ branding, an image of crossed swords comes to mind as a good fit for the name. We’re ready to do battle on the virtual football field, and want to be armed with branding to match. For this, let’s jump into option #3 above, and view the Peculiar Things fantasy football logo creator. When you click to select your chosen template, you’ll be taken to the main editing screen as you can see here. The Peculiar Things creator tool includes a grab bag of impressive and eye catching shapes. In the center, you can see a giant preview image. This is a live view of how your finished logo will look. As you make changes in the content placeholders around the sides, this preview image will update to reflect the latest adjustments. This feature saves guesswork and prevents you from having to continually download preview images as you dial in your edits. Around the sides, you’ll see placeholder blocks that enable you to edit the football logo template. On the left, you can change the titles and subtitles in the logo, along with their respective font styles, designs, and colors. On the right, note the pair of color choosers to switch up the palette of the logo template. Below this is the collection of different logos, icons, and mascots available for your use. Spend some time scrolling through these until you find the one that best fits your concept. For us, let’s select this crossed-sword logo, simply by clicking on the thumbnail once. Choose a new shape from the options on the right side to start customizing. As you can see, the new image appears in the design preview in the middle. It looks great and seems like a perfect fit for the fantasy football team name. 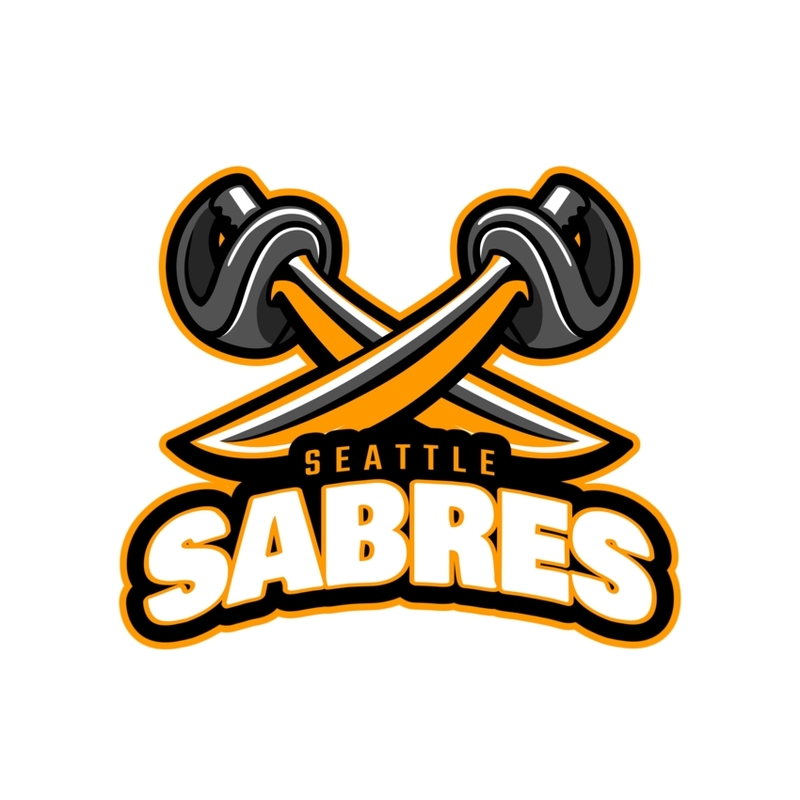 Next up, let’s replace the placeholder team name with our own team name, the Seattle Sabres. 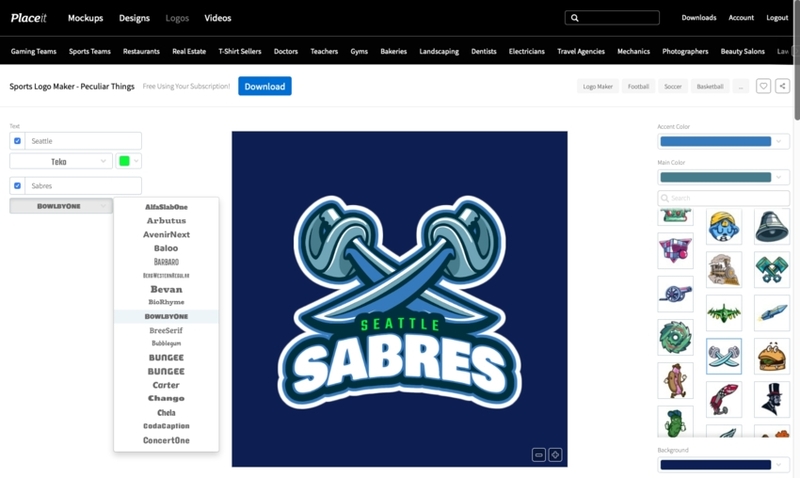 To do this, just click in the title box on the left side and type “Seattle.” Then, in the subtitle box below, type “Sabres.” We can also change the font of the team name to change up the look and feel of the entire logo. Simply click on the font chooser as shown, and explore the wide variety of fonts available in Placeit. When you find one you like, click to select it. Placeit will preview the new result and will automatically scale the other elements of the football team logo to maintain their size and shape. Update the selected text and font choices on the left side of the logo creator. Okay, things are looking great. But now let’s say that the default colors here in the football logo generator aren’t in line with our branding. Suppose our team colors are orange and black. Fortunately, this is amazingly easy to change thanks to Placeit’s powerful logo creator. To begin, click on the color chooser in the title placeholder box. With it open as you see here, click on one of the orange squares to apply that color to the Seattle title. Match the logo colors to your selected color palette using the selections below the text boxes. To wrap up, we’ll repeat these steps for the other four-color elements. Let’s make the subtitle white, and then switch to the right side to edit the colors of the full logo. We’ll apply the title’s shade of orange to the Accent Color as well, followed by swapping the Main Color to black. And finally, go ahead and remove the background of the logo by changing it to solid white. Boom. In just a few clicks, the Placeit fantasy football logo maker has given us a fabulous custom football crest that’s ready to use. As you can see, we’ve transformed a default logo template into a clean and completely new logo for our fantasy team. Of course, we can make additional changes simply by repeating the steps we’ve just discussed. When ready to download the finished logo product, let’s go ahead and click on the Download button at the top of the screen. Following the prompts, the full image file will be available in just a few seconds. The finished logo captures our team’s brand perfectly. Thanks to Placeit, we’ve built a thrilling fantasy football logo for our new team. Now it’s time to explore some of the ways to use this logo for marketing, promotion, or just for fun. Placeit offers far more than just fantasy football logo makers. It also features a breathtaking assortment of shirts, hats, mugs, bags, and more. Each one can be customized in the same fashion as a logo. 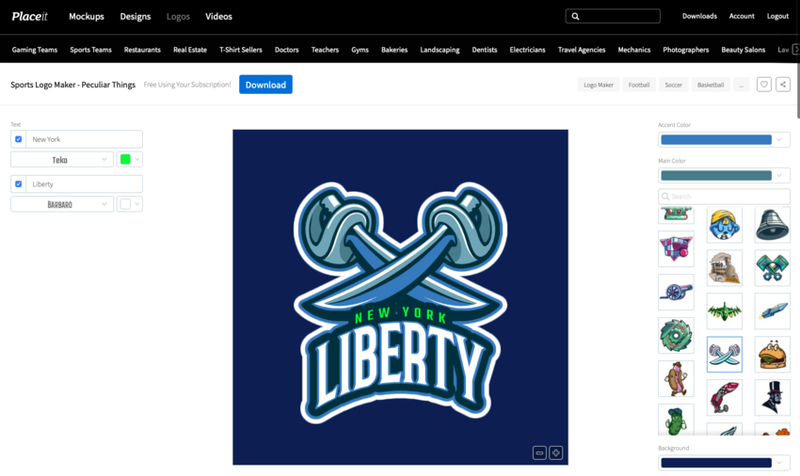 You can upload your logo and apply it to a live preview of the finished product, and then download the result. These can be used in turn to share with graphic shops that can produce actual products using your new logo! Let’s check out four the best ways to use your new fantasy football logo on Placeit. Show the flag of your fantasy football team by wearing it! 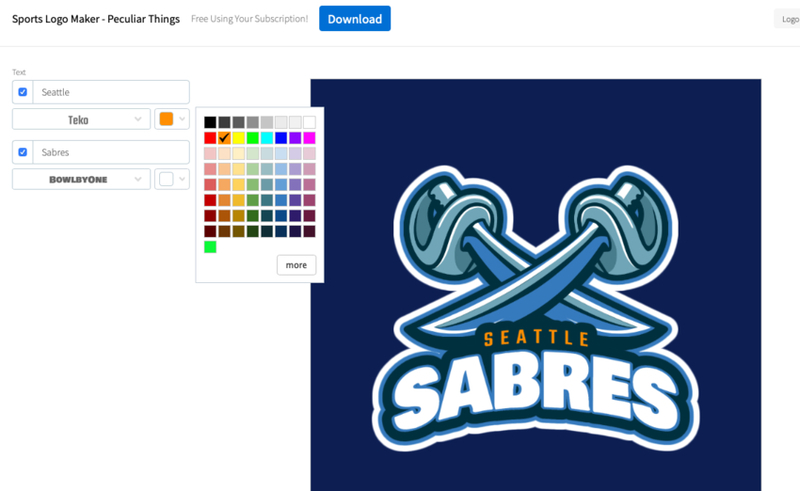 T-shirts are the quintessential show of support for everyone’s favorite team, and you can make your own in just seconds with this easy, quick shirt mockup template from Placeit. Order t-shirts with your newly created logo that show your team spirit! Pair your new shirts with a fantasy football logo hat as well. 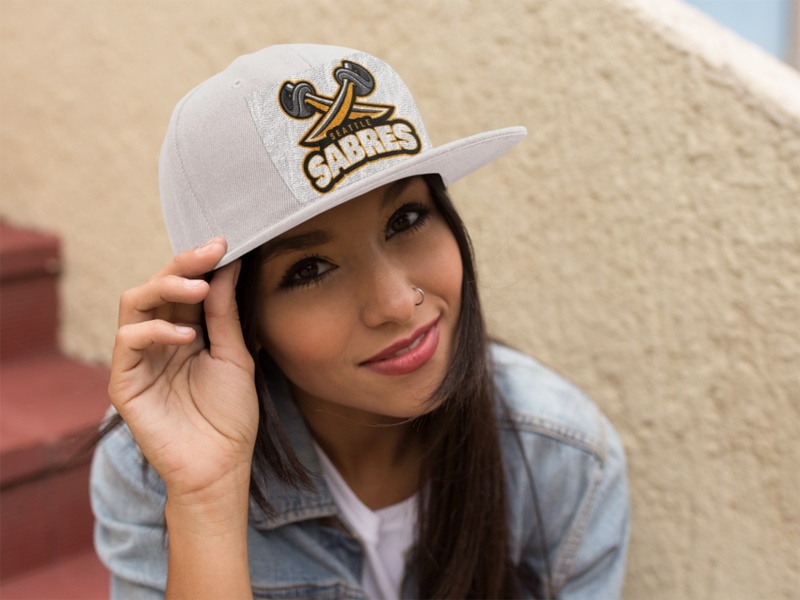 As you can see, hats are a great way to show off your logo design while making a style statement too! 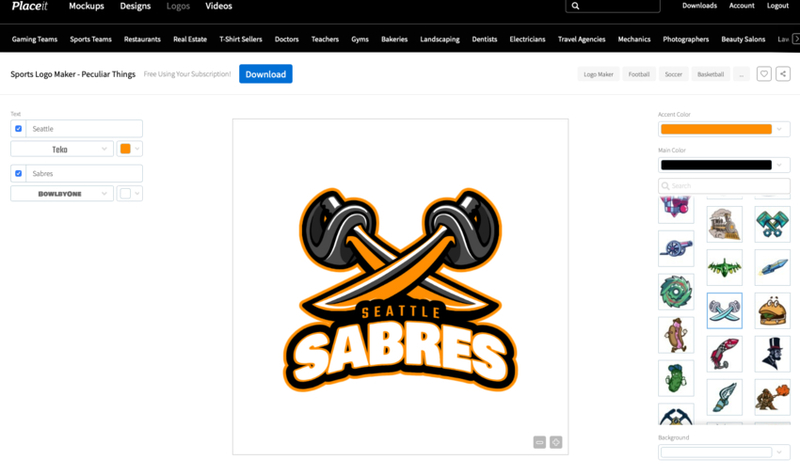 All it takes is uploading the logo image, and Placeit will instantly arrange and format it to match this logo hat mockup. Add your newly created logo to a signature hat in just a few clicks. Get pumped for your next big game even as you get your shot of caffeine, thanks to fantasy football logo mugs from Placeit. Choose from a variety of styles and orientations, and be sure to explore changes to the color palettes as well. Mugs make great gifts and stay useful long after football season is over. 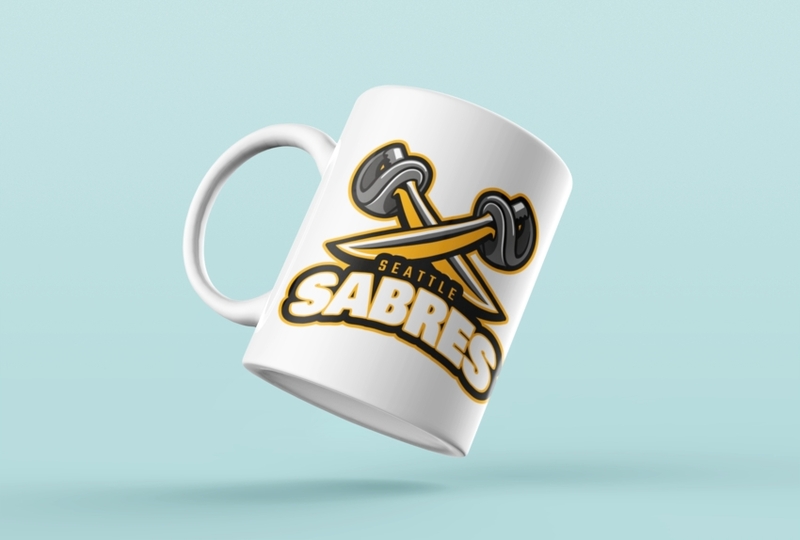 Help your fans start every day thinking about your team with a cup of coffee and a commemorative mug. By placing your new fantasy team logo on a bag, you can quite literally carry your team with you, wherever you go. Placeit has a variety of bag mockups, and this one strikes the perfect balance of style and utility. Use these to visualize design concepts that you can bring to life in order to share your winning team with family, friends, and everyone you meet! Placeit is now part of Envato, which offers other incredible resources for design projects. First and foremost is Envato Elements, a powerful toolbox of creative templates built by pros for use in your next project. If you prefer a more complete project that only allows for minor changes, check out Envato Elements selection of logos. Elements offers project design templates, stock photos, audio, video, and more. Every item on Elements is available for unlimited download for a single low monthly fee. And as you can see, Elements has thousands of options for your fantasy football logo design. Be sure to explore these as you work to build the best branding for your fantasy team. Don’t forget: your Elements subscription includes an unlimited Placeit membership too! Invest in your creative future and join Envato Elements today. Building a champion fantasy football team is hard work. But building a cool, stunning logo for it doesn’t have to be. Thanks to Placeit’s fantasy football logo generator, you can build an amazing new logo for your team in just a few minutes. Once you’ve got it ready, use Placeit to explore countless options for products and uses for the new logo. And be sure to combine Placeit with Envato Elements to unlock even more creative potential! Thanks to Placeit, building your own football logo design is easier than ever. Try it out today.